My first tattoo was a stylized Haida eagle on my lower back. I got this because of my First Nation's heritage and to celebrate getting my driver's license and my first job as an accountant in 2006. It was done my Anastasia Powell in Edmonton, AB. 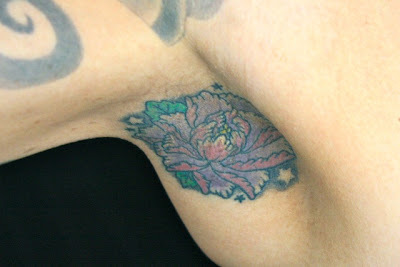 My second tattoo was the one on my left shoulder. I got this tattoo after my cat, Mr. Salt, died of diabetes on New Years Day in 2007. This tattoo was by Anastasia Powell in Edmonton, AB. My third tattoo was on my chest. 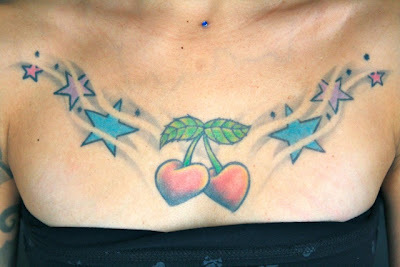 I had a dream shortly after moving to Vancouver that I had a tattoo on my chest of heart shaped cherries with stars shooting out from them. So the next day I was impulsive and I booked a consultation with an artist. The fourth tattoo I got was my 3/4 sleeve. I went through a very tough time in my life and I wanted a tattoo to celebrate that I was overcoming the rough period. 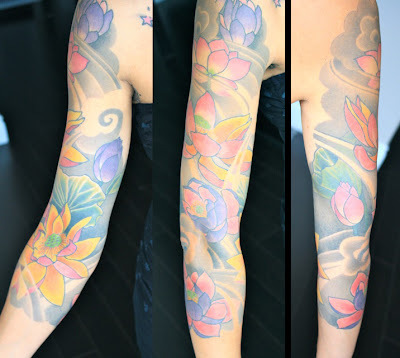 I wanted a Japanese tattoo with flowers and wind bars. This tattoo was done by Shoko Sonoda in Vancouver, BC in 2010. 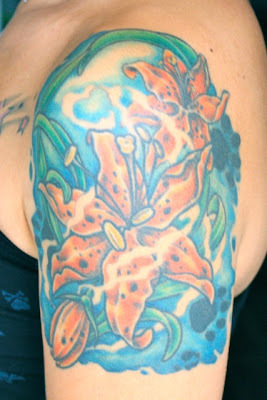 My last tattoos were a Christmas gift from my husband. I've always hated my armpits, I mean, no ones is pretty, but I thought mine were particularly ugly. I may get more stars added on to the tattoo in the future. These tattoos were done by Amanda Murray in Richmond, BC. I was just wondering if you are still able to wear deodorant now that your armpits are tattooed. Mine kind of are tattooed as a part of my half sleeve that I have done on my right arm and even if I use invisible deodorant you can still see it. so i have a serious question that has nothing to do with make up. so the thing is i am not motivated to do anything,..i mean i dont want go to classes , i dont wanna read, i dont even wanna leave the house. i just wanna know if u have any ideas on how to be more motivated. thanks. Yeah, I totally wear deodorant. After an hour or two the white disappears for me. You may want to see a psychologist of psychiatrist because you could be depressed. A serious lack of motivation could be a side effect of depression, especially if you don't even want to leave the house. Hi, I want to make you a question about the hair. I cut my hair like a pixie style, but not too short, but now I want a faux hawk, now the question, do you think that I must to wait to do it? Until my hair be more longer? Not sure how long your hair is, but if you google Mia Michaels and view the images you will come across her hair cut in a feminine fauxhawk. I think it can look fabulous as long as it's styled right, if not it can look quite masculine. I love all the cute earrings and hoops that you add to your flesh tunnels. I've been looking for something like that to add onto mine. Do you mind sharing where you got yours? What was the healing like for the tattoos on your armpits? Never though about getting a tattoo there! LOVE IT! Thank you! The healing was actually quite fast and very little itching. It took about a week for the skin to finish peeling and I feel that it was healed after about 2.5 weeks.